You know that in the past, I struggled with how to get my kids involved in the kitchen. You gave me some great ideas, which turned into inspiration for our Life Skills series. It was suggested that I let Elena pick out a box mix of a treat she likes. And so that’s what I ended up doing, in a roundabout sort of way. She came to me one rainy afternoon asking if she could bake a rainbow cake. She’d seen one on Pinterest and followed the link to a very complicated recipe. The situation could’ve gone a few ways. I could’ve said yes, knowing ahead of time that one doesn’t just jump into a complicated layer cake recipe for their first solo baking experience without the likelihood that something along the 32 steps will go wrong. After all, isn’t failure a great teacher? I could’ve said no, let’s find something more manageable for a novice baker. Or I could say yes, but encourage an alternate plan to get the same result. Had I said yes to the original recipe, and had she failed, we both would’ve ended up discouraged and mad. Me, for the waste of ingredients. Elena, for the realization that what looks easy on Pinterest isn’t always the case. In the future, I’d be wary of letting her try other recipes, and she might shy away from attempting any future baking projects for a long time. Had I said no, Elena would be less likely to ask again. And even if she did agree to something easier, it was a rainbow cake she wanted, not brownies or no-bake cookies. Instead I said yes, but encouraged her to swap the actual cake recipe for a box mix. She was totally okay (and even relieved) with my suggestion. Box mixes, whether for cakes, brownies, bars or muffins, are the perfect intro to baking for every novice. They provide just enough practice for measuring to hone those skills. The directions are short and simple to follow, giving fledgling bakers experience reading recipes and making decisions. They’re also inexpensive, so if for whatever reason they don’t pan out (oh yes, I went there), you’re not quite as mad as you might be if you dropped $15 on ingredients. There’s such a huge variety of box mixes these days, for every taste and dietary restriction, that anyone can find something they’d want to bake. On her first effort at baking from a box mix, I stayed in the kitchen – ready to help but keeping a respectful distance. She made the cake batter according to the directions on the box, and then customized her white cake into a rainbow cake by following a tutorial on a baking blog. She made a bigger mess than I would make, she did things differently than I might do them, but the end result was the same: a delicious cake. Now I realize you might balk at the idea of baking as a life skill you need to know. Plenty of people get by without ever turning on the oven. If you need something for the office pitch-in or you’re craving a brownie, you can just buy one, right? True, but like many “easy out” options in life, you miss something by not learning the hands-on way of doing the task. In attempting to bake, you’re paying attention to your food. You’re learning how to read a recipe and follow instructions. You learn how to use different tools in the kitchen. There are other valuable lessons rolled up into baking from a box as well. Getting the kids involved in the shopping for the mix teaches budgeting and grocery shopping skills. How much does a box mix cost versus buying individual ingredients? Do they have all the ingredients they need, above and beyond what the box provides? What about equipment? Do they have the pans they’ll need? And then there’s the clean-up afterwards. Being proficient in the kitchen means cleaning up after yourself and leaving your workspace as you found it. Maybe the kids try it, and realize baking just isn’t their thing. That’s okay! At least they can say they tried, and move on to other pursuits. I shared with Elena that I love baking from scratch, but cakes aren’t my forte. I started out with box mixes, spent a few years attempting to bake cakes from scratch and failing, and came back around to box mixes. It’s not failure – it’s realizing where your strengths are and where you should step back and find another way. Like the way to the local bakery when your kids’ birthdays roll around! 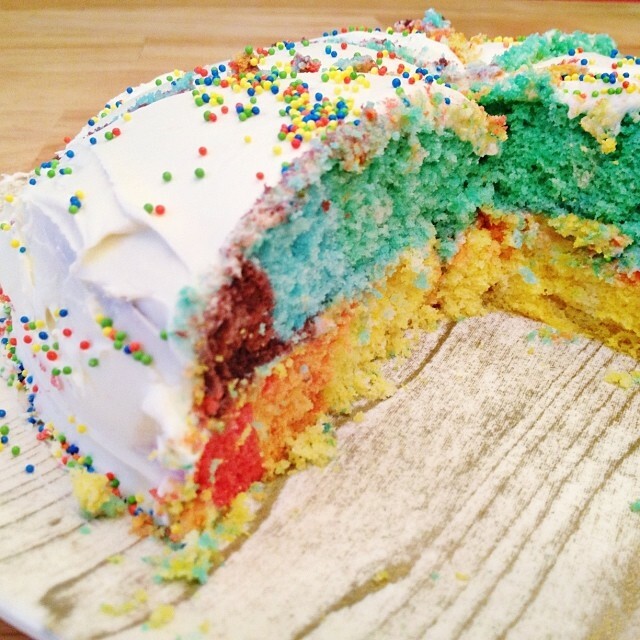 Apparently, baking rainbow cakes is Elena’s thing! The first one barely lasted through the day. Last week, she baked another, completely on her own. She entered this one in our neighborhood block party bake-off, and it took first place in the kids’ category. She was so proud of herself. Of course, I’m all about encouraging the kids to try new things, so I’m stocking up on a few kinds of brownie mixes next. I mean, they need to practice these valuable life skills that involve chocolate, right? I’m selfless like that! 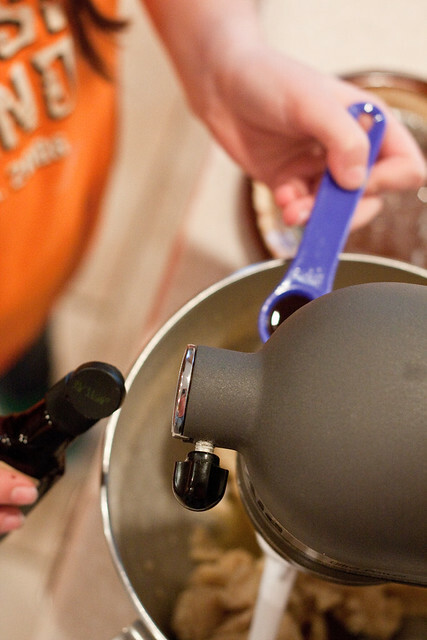 Have you let your kids bake with box mixes yet? If so, what age did you start? And how about you? Did you start out on box mixes and graduate to baking from scratch? My first experiences baking were from scratch with an adult but I was allowed to bake on my own from a box mix once I learned my way around the oven, say about 10YO or so. I did bake from scratch too, and I remember the times I forgot to put in baking powder, etc. But the most distinct memory I have about baking from a box mix has nothing to do with baking itself: I went to remove the plastic bag of cake mix from its box and, due to what must have been a packaging error, the bag tore and the mix spilled all over the floor. I cleaned it up and told my stepmother about it, and she suggested that I contact the company. I wrote a letter and mailed it to the address on the box, Not long after that I received a letter of apology from them with enclosed coupons for more cake mix! Now THAT is a teachable moment you can’t plan for when you think about letting your kid make a cake on her own.